Your Online Cholesterol Readings Guide is a premier Cholesterol Readings information platform that provides individuals with a quality in-depth look at Cholesterol Readings and the associated products, services and information available today. The web server with the IP-address 68.178.254.168 used by Cholesterol-readings.net is owned by GoDaddy.com, LLC and is located in Scottsdale, USA. There are many websites run by this web server. The operator uses this server for many hosting clients. In total there are at least 124 websites on this server. The language of these websites is mostly english. 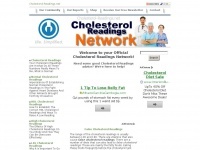 The websites of Cholesterol-readings.net are served by a Apache server. The visitor analysis software Google Analytics is used to analyze the visitors of the websites. The website does not specify details about the inclusion of its content in search engines. For this reason the content will be included by search engines. In order to display ads the Google Adsense advertising network is used.